October 31, 2015 nicolahughes77Leave a Comment on If the X Factor was the Guilt Factor I’d get to Judges Houses! If the X Factor was the Guilt Factor I’d get to Judges Houses! When you’re on your way to work do you feel guilty for leaving your children? Then guilty at work because you’re only part time and can’t get as much done. Guilt is great if it’s appropriate. If you have hurt someone, gossiped about a friend, been rude to your partner then guilt wakes you up to that and hopefully encourages you to make amends. I’m talking about the guilt we get when we haven’t done anything wrong we are just trying to muddle through life and keep everything in balance. We could spend some time psychoanalysing where our guilt comes from. Freud certainly comes up with some interesting suggestions (see the link below). But I really don’t think you have the time right now. So instead do what I’ve done. My immediate plan has been to accept that my life will contain a certain amount of guilt. I focus on keeping that at a manageable level. I let myself off the hook all the time and you can too. A jar of ready made baby food is ok. Oven pizza instead of freshly prepared food is a life saver. Growing your own veg is not essential neither is owning your own chickens. Children being covered in mud and insisting on wearing their superman outfit to school will amuse everyone else. Crying like a baby as you leave your youngest at nursery for the first time while you go to work is your right as a mother. You are a good person, you don’t deserve to be carrying a huge load of guilt around with you. Just let it go….at least most of it! If you don’t you’ll end up stressed, overwhelmed, and depressed. It’s okay if your guilt gets you to the 6 chairs but don’t win the guilt factor! 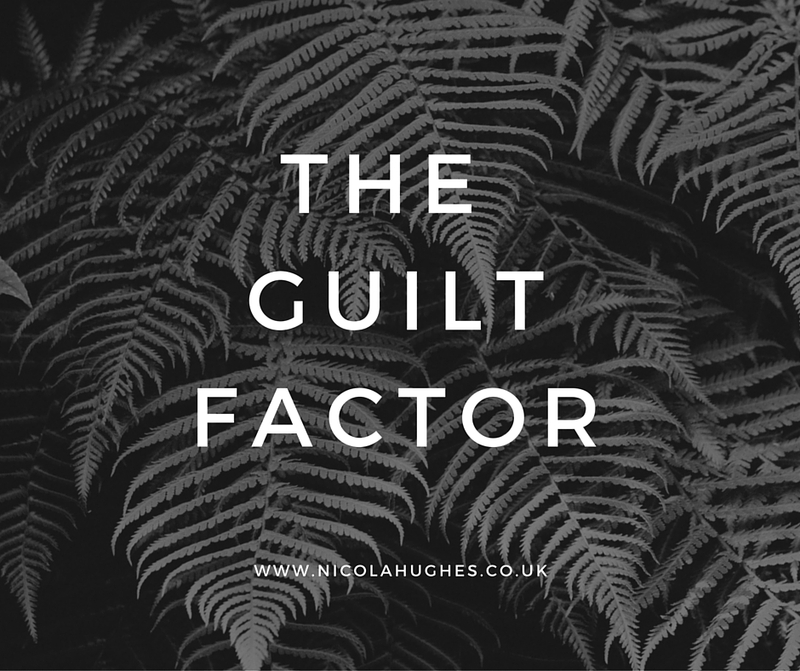 If you’ve realised your guilt factor is too much and you want help restoring some balance in your life please contact me for your free coaching session. Then join me at www.facebook.com/nicolahughescoaching for latest musings on life. Ps if you want to read more about guilt there are some articles here.